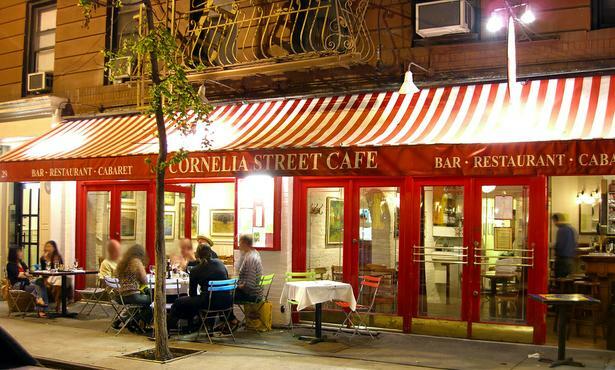 It would be a shame, I thought, while here in New York s a guest at the Rolex Arts Weekend, not to take the 1 train down to Greenwich Village, hear some jazz, talk to people, and to get the briefest of impressions of the scene. The choices here can be overwhelming... The monthly free newspaper New York City Jazz Record (formerly AAJNY) lists - in its 48 information-packed pages - a total of thirty-four gigs plus twelve weekly residencies in New York for last night alone. And one of the two gigs I went to wasn't even listed among those forty-six, but had been spotted by a sharp-eyed friend. Sometimes the stranger can feel like he's walked onto a 24-hour film set. On Seventh Avenue, as one strolls past the Village Vanguard, the taxis heading downtown are pushing forward eagerly in anticipation of the traffic lights changing. The subway is down there rumbling below the sidewalk. There are quite few people purposefully taking instrument cases out of cars. And I'm heading for Christopher Street, immortalized by Leonard Bernstein, Betty Comden and Adolph Green. I'm trying very hard not to hum that particular ear-worm as I walk southwards. First stop is the 6pm set at the 55 Bar. No cover charge. Friendly. The walls look as if they still bear the smoke of a long-forgotten era. The centrepiece is the bar. Almost 20 people perch - silently- on ar stools. The majority (I'd guess the place holds 55 at a pinch) are at tightly packed tables. The prominent clock in the 55 bar, I discover - eventually - is set, on purpose, around 25 minutes ahead of terrestrial time. Spike Milligan might have enjoyed that. Emigre South Londoner, vocalist Tessa Souter is here with just the bass of Sean Smith - celebrating a birthday- for musical company. What is surprising is that this pared-down instrumentation never leaves the listener needing more. How do they do that? Well, Souter has an unparalleled sense of line, a deep knowledge of every song, while Smith string-crosses, double-stops, and has clearly thought through how the bass can become an orchestra. Apart from a solitary riff from the barman on cocktail shaker during Souter's opener, Afro Blue, the whole audience is held in rapt attention. Souter announced a new album with out next spring, and it's something to look forward to. She was asked by a Japanese record company to write lyrics to go with themes from classical music. Title track of the new album Beyond the Blue is Chopin E minor prelude (it's this one) , and could be the song to launch a thousand covers. OK, a few tens perhaps. Souter is a fine writer - please write for LondonJazz again! Her lyrics are about the palpable presence of love, they fit the tune like a glove. Plus there's Brahms and Borodin and the Kings Speech theme from Beethoven 7. The next stop is just a short walk away. 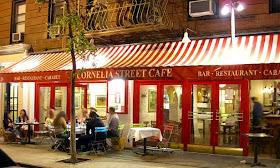 The Mark Shim Quartet are at the Cornelia Street Cafe, another basement. This time there's a cover charge of $15, plus a $10 drink/food minimum. Mark Shim is a Jamaican- born tenor saxophonist who made three albums for Blue Note in 1998-2000, including Turbulent Flow, which I remember well. His phrases were always probing, angular, and he has moved further. His tone on tenor is now the equal in solidity and power of a player like Pete Christlieb. For contrast he plays the EWI (Electronic Wind Instrument)with a gentler, trombone-like sonority. He plays it musically, treats it like a natural acoustic horn, doesn't indulge in the instrument's potential for multi-octave extreme effects. His main sparring partner in this quartet is the powerful drummer Damion Reed, and the two of them constantly throw rhythmic challenges at each other. Along with characterful electric bassist Burniss Earl Traviss, the intensely rhythmic pianist Luis Perdomo, this is a quartet fully, all-consumingly engaged in energetic, fierce, intense interplay. The scene in New York, particularly in this part of town is huge. Jam session culture is far more prevalent - Smalls have one at 4pm , then two houses, segue-ing into another jam session at midnight. A cornerstone of the scene is the eighth season of Steve Coleman's regular Monday workshops at the Jazz Gallery . "There's less fear," mused one young emigre Londoner whom I met. And, of course, another difference...for those with the stamina...this is the city where, unlike London, the subway never sleeps. Why DOES the tube in London have to close for six hours every night?